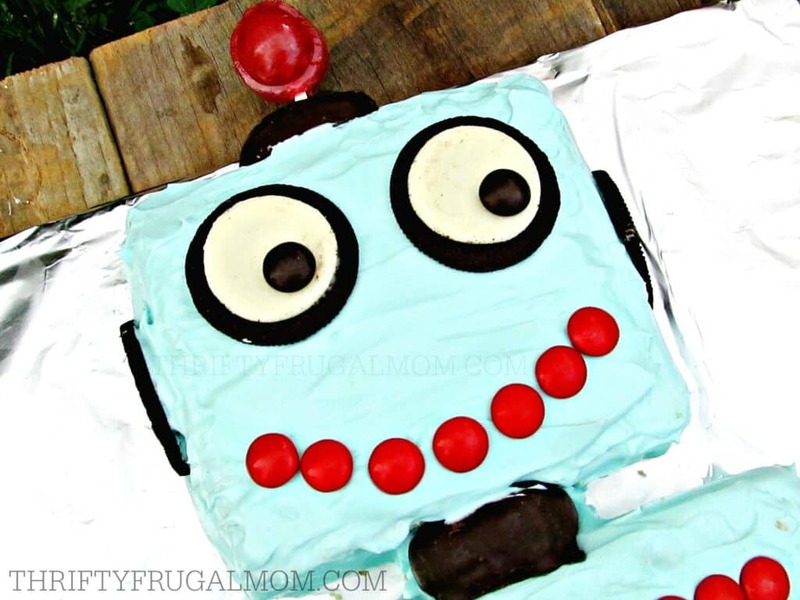 Learn how to make this fun, easy robot cake. It’s perfect for birthdays and is made from a simple 9 x 13 cake. And isn’t it the cutest robot ever?! For his 7th birthday, our son wanted a robot cake. Well, actually he’s the indecisive type and that was what he finally settled on after lots and lots of deliberating. And after getting numerous of his great ideas vetoed by me because I’m no birthday cake making expert and can’t handle anything that’s too complicated. (Am I the only mom that does that?!) 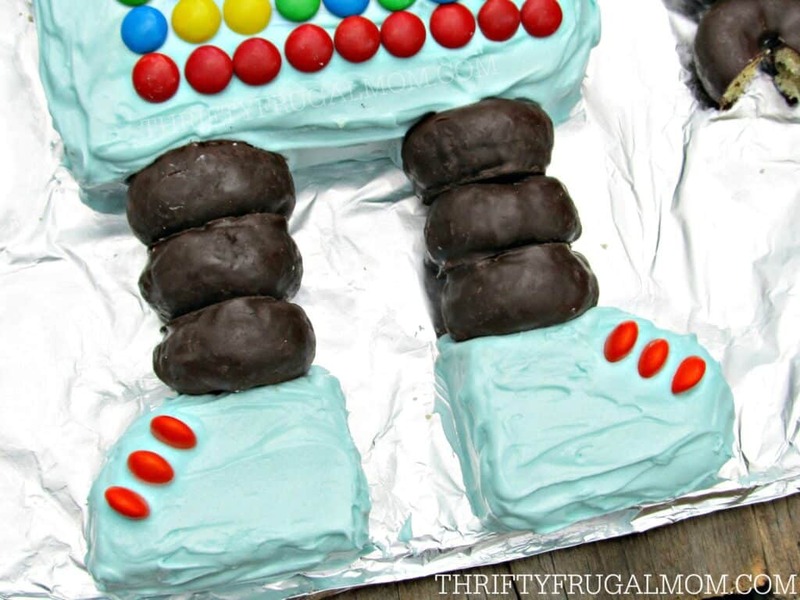 But when he finally did decide that a robot birthday cake is what I should make, I was kind of excited, because it sounded like a fun idea…and it was! And didn’t our Mr. Robot turn out to be quite cute? We sure thought so! 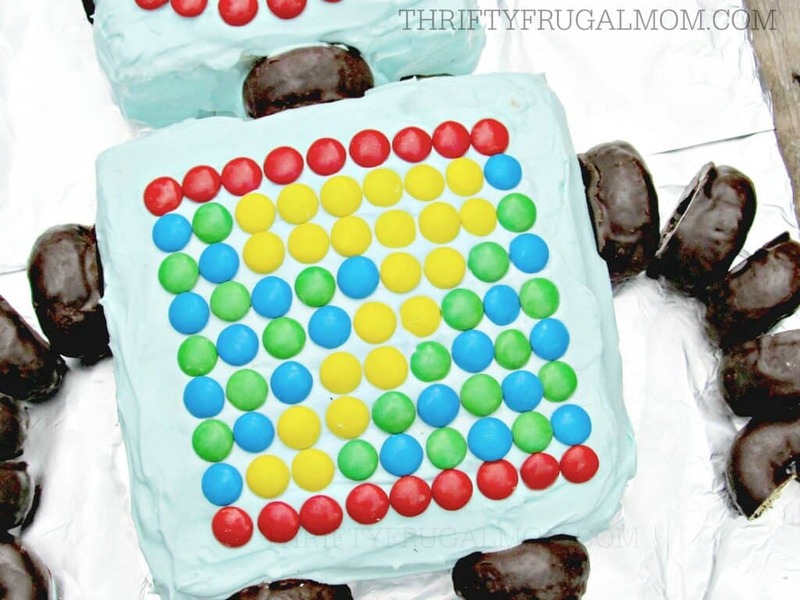 Let me show you how to make your own easy robot cake. 1. Mix up cake and bake in a 9 x 13 cake pan, according to the recipe that you use. Once the cake has cooled, invert pan and carefully remove cake from pan. * Flipping it onto parchment paper or saran wrap will help reduce the mess. 2. 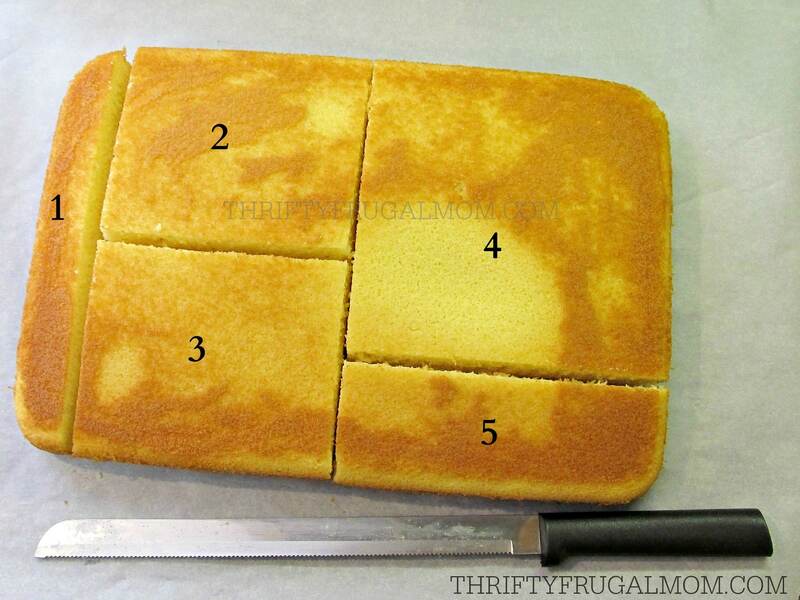 Using a serrated knife, cut the cake into 5 pieces as shown. 3. Arrange cake on cake board -I covered mine with tin foil-, using piece #2 for the robot’s head and piece #4 for the body. Place a chocolate covered doughnut between the 2 pieces to create a neck. Tip: Using a pancake turner to move pieces around works really well! 4. Cut piece #5 into feet. I trimmed off the rounded end part and then cut what was left in half. Then I simply trimmed off the one corner of each half to make a shoe shape. Place 6 chocolate covered doughnuts below body to create legs and then position the shoe pieces at the end. 5. Using your mixing bowl, mix up your frosting, then add food coloring to get the desired shade and color. If you are using dark colored M&M’s for decoration, you will want to keep the frosting color light. 6. Remove the doughnut “neck” and “legs”, then frost cake. I like to do a really thin first coat of frosting to “seal” in the crumbs and then go over it all again with a thicker second coating. Carefully push the doughnut “neck” and “legs” back into place, touching up frosting as needed. 7. Gently push 3 M&M’s into each shoe, creating “buttons”. 8. Take 2 doughnuts and cut out a small notch to create a hand as shown in the picture above. Then arrange 10 doughnuts, 5 on either side, to create arms, placing the “hand” doughnuts at the end. 9. Decorate the robot’s head. To make the eyes, carefully pull Oreos apart, leaving all icing intact on one cookie, then add a brown M&M. The remaining Oreo cookie halves will become the ears. Shape a smile out of M&M’s. Finally, add a doughnut with a lollipop pushed through the center to the top of the head. 10. Decorate the body, using different colored M&M’s to create your design. I found it helpful to arrange my M&M’s in the pattern that I wanted, before putting them on the cake. * Lining your pans with parchment paper makes the cake easier to remove. Also, I like to wrap my cakes in plastic wrap and then freeze for several hours before frosting them. This makes it easier to frost because there are fewer crumbs due to the cake being frozen. 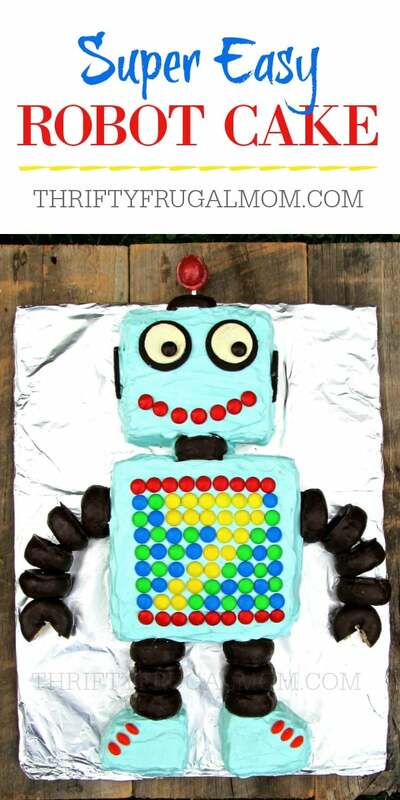 * If you are planning to feed a lot of people, you probably will want to make an additional non-decorated cake since this easy robot cake ends up actually not using a whole 9 x 13 cake. Very cute! 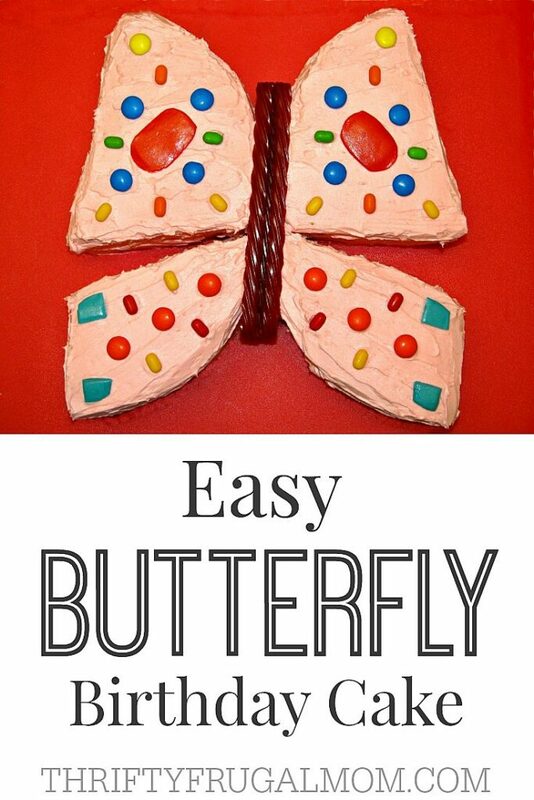 looks fairly easy too, though I've never really tried decorating cakes. This cake is adorable! Just wondering if you used regular size m&m or the large ones? Thanks, Nicole! Yes, I used the regular sized M&M's. 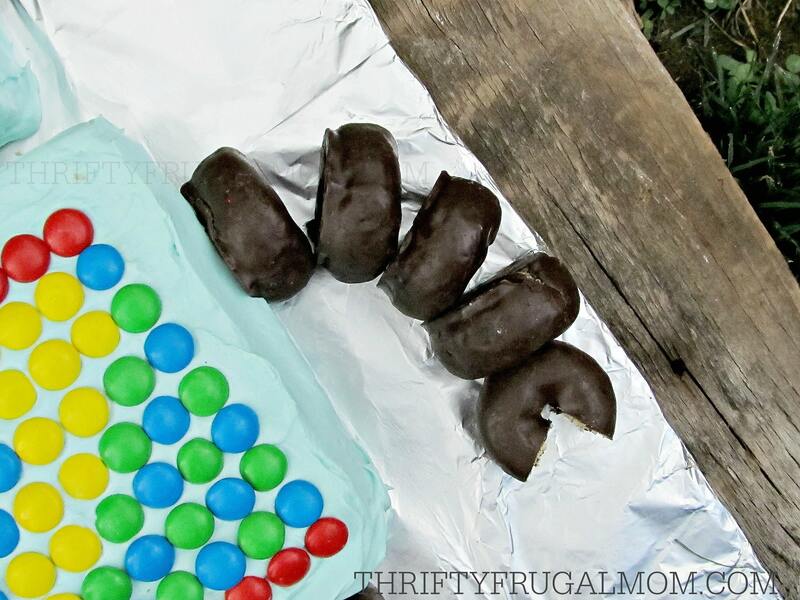 Of course you can always use your own creativity and use any candy that you have on hand to do similar decorating too! I don't know for sure, but if you look at the cake picture above instruction #2, it should help. The cake was a 9 in. by 13 in. cake. So piece #4 was probably about 7 in. square. #2 and #3 bout 5 in. square and piece #1 about 2 in. wide. That will leave you with piece #5 the size it should be. Hope that helps! I just made this cake for my son's 4th bday, and it really was easy! I followed all instructions to a T and it came out amazing. I made it the morning of his party and I was quite sure I was going to have to make a last minute run to the store for a generic bday cake when this one didn't turn out. BUT IT WORKED!!!! I even made the frosting you suggested. Thank you for creating something even someone like me could do. My son turns six in April and he requested a robot cake. He is so excited to have this one 😀 He saw the picture and said it is exactly what he wants 😂 Looks pretty easy so I am going to try! 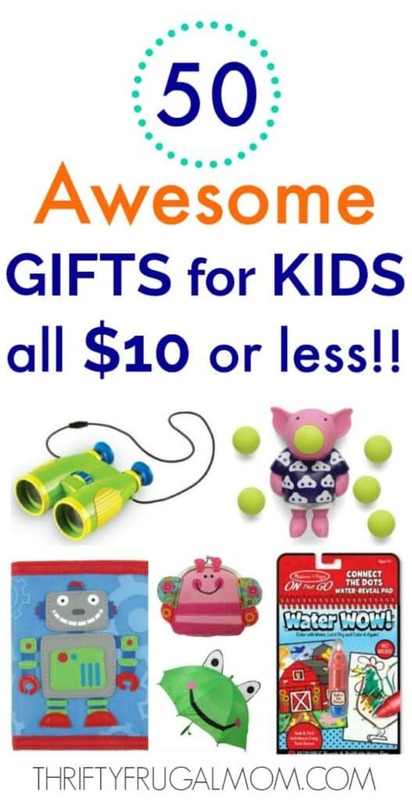 I hope it helps make his birthday memorable and special, Debbie! This cake was one of my favorite cakes ever to make because it was super cute but so incredibly easy. I think you'll have fun making it! What size cake board did you use? Good question! It's been 3 1/2 years since I did this and I think I actually just cut a cardboard box down to fit what I needed. But I did a little figuring and I think a 13x19 cake board would work. I don't think you'd have a lot of extra space with it, but I think it would work. If you try that size I'd love to know if it worked well!